Samuel Langhorne Clemens, born on 30 November 1835 in Monroe County, Missouri, was never one to let the facts get in the way of a good story. A natural-born storyteller, Mark Twain freely adapted the incidents of his life and the stories he heard as a youth to embellish his fiction, as well as his travel writing and autobiography. However, this presents a problem to the modern biographer: in accounts of Twain’s life, how does one tell what is true and what is just a colourful yarn? 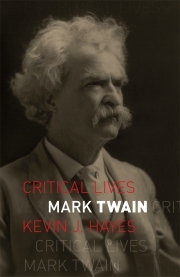 In this new account of a gifted, charismatic character, Kevin J. Hayes reviews Twain’s life, from his early journalism to his masterpiece Huckleberry Finn, from the travelogue Life on the Mississippi to his final work, the sprawling, episodic Mark Twain’s Autobiography, and the public-speaking engagements that took him around the world. Synthesizing new information and sifting through the evidence, Mark Twain is a fresh, clear-sighted account of a crucial American writer. Kevin J. Hayes is Emeritus Professor of English at the University of Central Oklahoma, currently living and working in Toledo, Ohio. He is the author of many books including The Road to Monticello: The Life and Mind of Thomas Jefferson (2008), Edgar Allan Poe (Reaktion, 2009), George Washington: A Life in Books (2017) and Herman Melville (Reaktion, 2017).